Register Log In Home Forums European and Import Motor Oils Pennzoil Euro OW-40 - Why Is it Being Clearanced? 120 registered members (addyguy, 53' Stude, 1978elcamino, ad244, 55hambone, 2010Civic, 7 invisible), 2,191 guests, and 25 spiders. Anyone know why WM is clearing it out? I scooped up nearly 100 quarts for my GLC (it meets MB 229.5), but I was curious about the rationale. First off, I wanna thank you for owning a new Merc and maintaining it yourself. I wish more people were like you as it would make the oils for those who own German more widely available. As to why Walmart is clearing out the oil? People aren't buying it. Less and less people are changing their own oil by the year. Even more people who drive vessels that spec a Euro oil pay someone to change it rather than you or I who maintain our own vehicles. And there is a possibility it's being discontinued in some stores but might remain available in others. This exactly. Many new cars are coming with the maintenance included for x years or miles. I didn't even know the oil existed until a few months ago... And now it is all gone. I tried it in the 911 and didn't care for it. I drained it and put it back in the jugs. It'll probably go into my sister's Rabbit. I've got way too much HDEO now though, thanks to Walmart. This really confused me at first because Merc still means Mercury to me. Dad was a Merc man...his last car was a Marquis, I'm sure he wanted the Grand Marquis but wanted to economize a bit. I sw this too just yesterday! Anniston, AL (says store/lenlock) and it was sold for $3 per qt!! Next to it were like 7 5qt jugs ofmsyntec 0w-40! Those were marked down to $21 per bottle! First off, I wanna thank you for owning a new Merc and maintaining it yourself. I wish more people were like you as it would make the oils for those who own German more widely available. As to why Walmart is clearing out the oil? People aren't buying it. Less and less people are changing their own oil by the year. Even more people who drive vessels that spec a Euro oil pay someone to change it rather than you or I who maintain our own vehicles. And there is a possibility it's being discontinued in some stores but might remain available in others. Thanks for the kind words. Honestly, I do not see a big deal in maintaining my MB versus say, my PSD which is more complicated with fuel filters and such. I dumped the oil in the GLC at 1,600 miles to remove the break-in metals (the oil was "pearl-like" when swirled) and it took about the same amount of time as it does for my Explorer. There was no way that I was going to pay $175+ for an oil change at the dealer when I can easily do it myself for far less than 1/2 that amount. Obviously, documentation must be maintained, but that is a simple job. 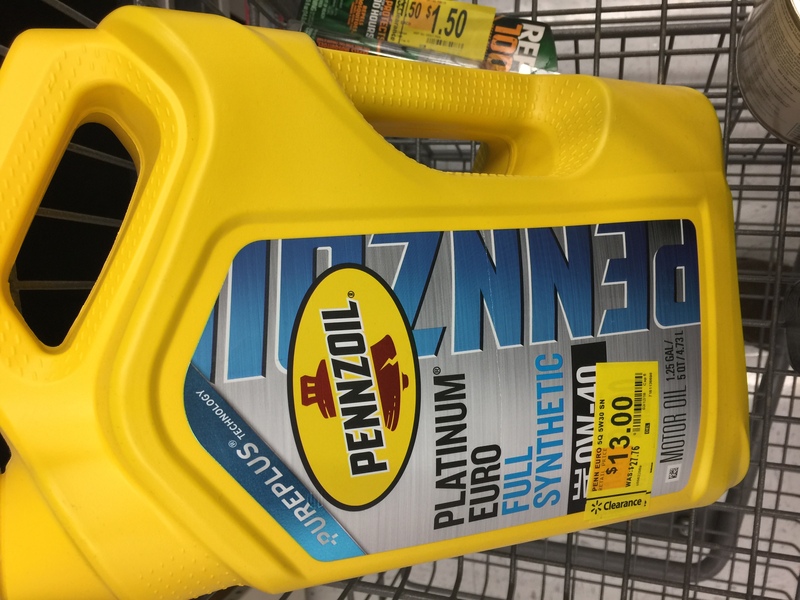 After I use up my stash of Pennzoil Euro, I will have to choose between M1 Euro (which is the factory fill) and Castrol Euro, but at least those go on sale at WM from time to time, so I will have to watch and stock up. Every time I check Walmart...all I see is $25-$27/jug for 0w-40 Euro. The online price is cheaper. Ask them to price match to the online price. There�s actually a lot of things that are cheaper online at WM, so just get in the habit of having them price check. They are trying to get people on their app to take on Amazon. That's exactly what I did last week when I ordered online(pickup at store) and picked it up at the same store for less then it was on the shelves. Next to it were like 7 5qt jugs ofmsyntec 0w-40! Those were marked down to $21 per bottle! Pure speculation here; perhaps WM has determined through sales data they don't need 3 euro spec'd oils and took out the lowest selling SKU. I don't know why, but the European equivalent (Shell Helix Ultra 0w-40) is currently hard to find on the shelves in the UK, plenty of 5w-40 but not 0w-40.